April 1, 2016 – MAVEN data collected between November 15, 2014 and November 15, 2015 is now available to the public. The latest release from the MAVEN Science Data Center includes data from all of the spacecraft’s instruments, as well as “Key Parameter” and Ancillary data. The MAVEN Science Data Center website contains interactive browse plots, a form for searching and downloading data, a list of mission events, and an IDL toolkit for retrieving and visualizing data. The goal of NASA’s MAVEN mission, launched to Mars in November 2013, is to determine how much of the planet’s atmosphere and water have been lost to space. It is the first such mission devoted to understanding how the sun might have influenced atmospheric changes on the Red Planet. 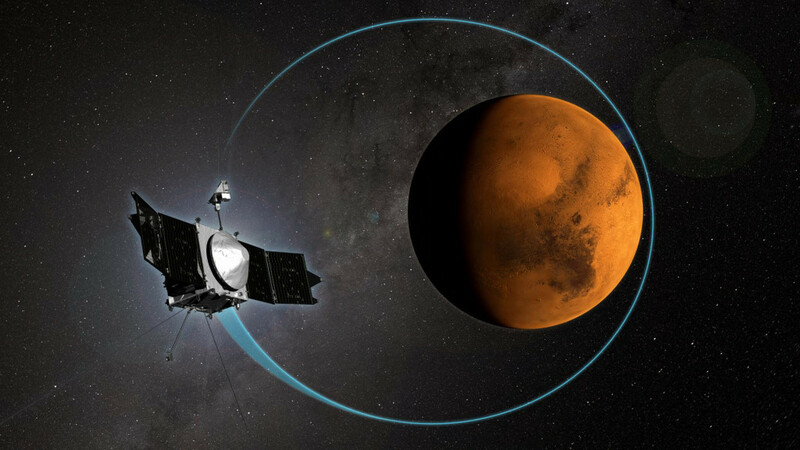 MAVEN is currently on its extended mission through September 2016. All of the instruments and the spacecraft are working well. There are roughly 30 scientists, graduate students and undergraduates from the University of Colorado’s Laboratory for Atmospheric and Space Physics who are on the science team and analyzing the MAVEN science results. CU-Boulder provided two science instruments and leads science operations as well as education and public outreach for the mission. LASP’s Bruce Jakosky is the Principal Investigator. Click here to visit the MAVEN Science Data Center.